Resident Evil Restaurant "Comig Soon"
Brain licker may be on the menu in a new Resident Evil theme restaurant. 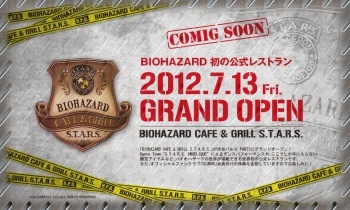 This one looks like a gourmand fan favourite; a Resident Evil restaurant will open in Shibuya, Japan, on July 13th. The restaurant, which will only be open for one year, will offer limited collectables from the series as well as theme meals and other delights. Pity about the "comig soon" business, but apparently this is one of the most common typos in Japan. It's just a shame it had to happen to Capcom, source of Resident Evil: "Revelaitons", distributor of the Resident Evil 6 "Exclusive Merchenaries Map". Or the "near impossible chanllenges" in Asura's Wrath, for that matter. The Biohazard CafÃ© and Grill will open up at 11 am on the 13th - yes, that is a Friday - and will be located on the 7th floor of Shibuya's Parco 1, for those of you Resident Evil fans who live in Japan or can afford the air fare. No news on what they're likely to be serving, but the Capcom Bar in Shinjuku features such delights as Tyrant Rib Steak, with Licker Brain Cake for pudding. Hopefully Biohazard's menu will be as interesting!